These natural butter toffee flavored roasted almonds are delicious and healthy. A great snack option for those of us with new year resolutions of eating better and losing weight. 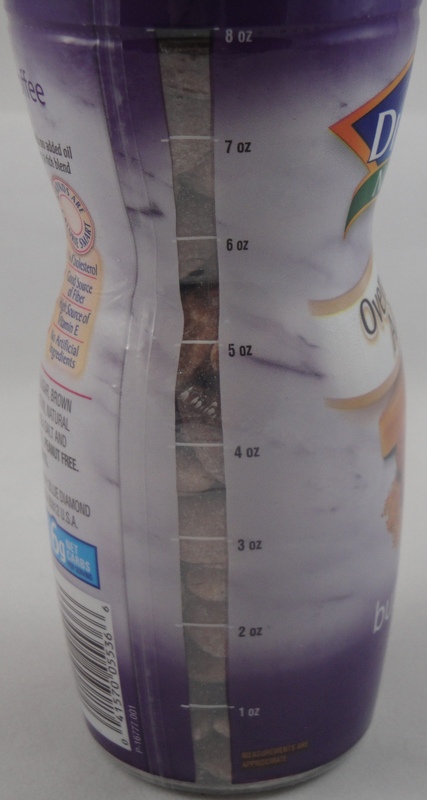 A great feature of these almonds is their handy serving size measurements on the side of the container. You can see how much you are eating or portion the servings out accordingly. Besides being able to judge serving size correctly, these almonds are deliciously sweet & satisfying without much sugar. Stevia is a sweetener in these almonds. Usually, I find stevia (a natural high potency sweetener) disagreeable with a bitter aftertaste. In these Blue Diamond butter toffee almonds, there are no off notes or a lingering bitter aftertaste. The sweetness level is perfect. The almonds smell like butter toffee nuts, taste delicious and are satisfying. As I munched on these butter toffee almonds, I was reminded of Quaker Oats instant maple & brown sugar oatmeal. Is maple & brown sugar like butter toffee? Not exactly, but both taste sweet and caramelized. The butter toffee flavor also has a little more creamy character (slightly coconutty). A flavor ingredient I would suspect is in this natural butter toffee flavor is fenugreek extract. Fenugreek contains an aromatic: sotolone which has a potent maple syrup aroma. Besides maple flavor, Fenugreek is used in curries and tobacco. Nutritionally, almonds are a great snack. They are loaded with monounsaturated fats which have been shown to lower cholesterol. Almonds are also packed with manganese, fiber, zinc, and vitamin E. The natural oven roasted butter toffee flavored almonds are low in sodium and the ingredients in these almonds are straight forward: almonds, sugar, brown sugar, corn maltodextrin, natural flavor, sea salt and stevia. It appears that these are a “panned” almond; meaning the coating flavors is applied by turning in a barrel with air to dry. I really like these butter toffee flavored natural oven roasted almonds by Blue Diamond and will be purchasing again. I am very impressed!